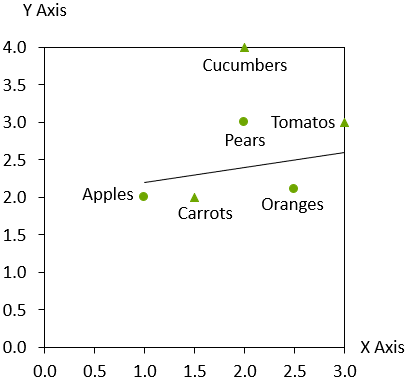 Scatter charts and bubble charts are similar in many aspects, both using an xy-plot to visualize datasheet contents. The charts differ, however, in the style of markers used for the individual data points. The Group column in the datasheet can be used to organize individual data points into groups. In the above scatter chart datasheet, the first three data points belong to group A while the remaining data points belong to group B. 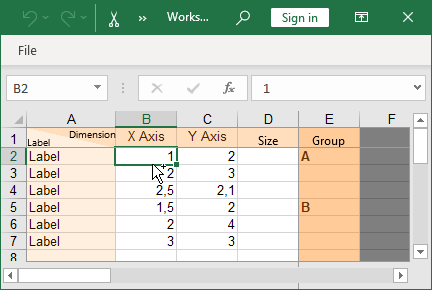 Multiple data points belonging to the same group can be easily selected by clicking on a data point and then moving the mouse pointer while holding down the Shift key (see Multi-selection). The axes of scatter charts and bubble charts can also be adjusted. Please refer to Scales and axes for details. You may also use dates for the X or Y values. When all cells in the datasheet for one axis contain dates and Excel’s cell format is set to Date, then the tick mark labels of this axis show dates and you can format them accordingly (see Date format control). 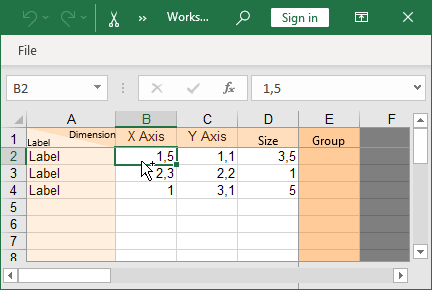 If Use Excel Fill on Top is selected (see Color scheme), you can set the fill color from Excel’s cell formatting in any cell in a data point’s row to set the color for this data point’s marker. In both chart types, up to two labels can be associated with each data point. Labels can be added using the Add Label button and removed using the Remove Labels button. The label content control lets you select the format of the text field for each label, allowing the display of the label text as well as the x, y and size values (see Label content). By default, labels are disabled in charts containing more than 200 data points. If required, they can be enabled using the context menu. The automatic labeler places labels as close to their data points as possible, using connecting lines if necessary (see Automatic label placement). While the labeler is busy calculating the label placements, a rotating progress icon appears in the upper left corner of the chart and the concerned chart is highlighted with a light gray frame. You can save the file or continue to work on other charts or slides while the labeler is running. In rare circumstances the labeler may not find an optimal placement for all labels. When this happens, manually placing labels will help. Try to manually place one of the poorly placed labels and let the labeler automatically place the remaining labels. An acceptable placement for all labels can normally be achieved by manually placing only a few problematic labels. 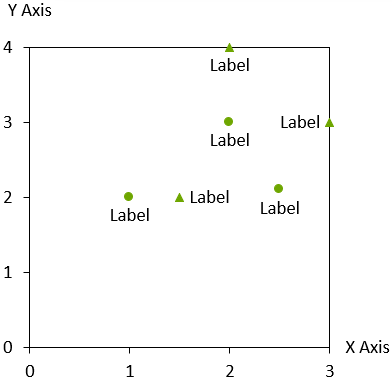 The scatter chart uses the marker scheme control to consistently mark data points belonging to the same group (see Marker scheme). The marker shape control can be used to set the marker shape for individual data points (see Marker shape). If you choose No Markers in the marker scheme control, the markers for the data points are switched off. 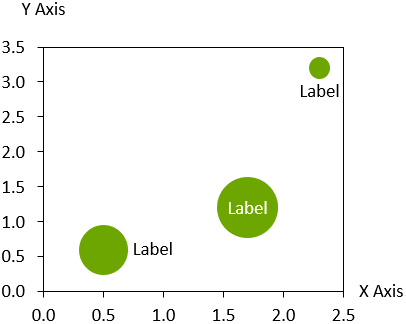 In this case the labels are centered on the position of the data points. However, the automatic label placement may offset the labels from this position to prevent overlap. It is not possible to both switch off the marker and hide the label for a data point. The bubble chart is a variant of the scatter chart, with data points marked by circles. The circle sizes are determined by the values in the Size column. By default, the Size value is proportional to the area of the circle. The Make Diameter Represent Size button in the context menu can be used to set the Size value to be proportional to the diameter of each circle. To enable a legend of the bubble size, click Add Bubble Size Legend in the chart’s context menu. To change the bubble size used in the legend, select the bubble and drag the handle that appears on the right boundary. When you select one of the bubbles inside the chart, a similar handle appears on the right boundary. Change the bubble size by dragging it. All other bubbles are scaled accordingly, as the ratio between bubbles is always determined by the numbers in the datasheet’s Size column. When two bubbles overlap, the smaller bubble will be shown in front of the larger one. To change the order, choose Bring to Front from a bubble’s context menu. In scatter or bubble charts you can let think-cell calculate a trendline for a group of values. A trendline is a graphical representation of trends in the group. 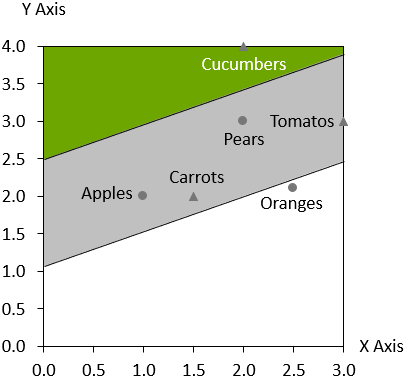 They are used for the study of problems of prediction, also called regression analysis. The trendline is calculated using linear regression so that the sum over all points of the quadratic difference between the Y coordinate and the trendline value at the X coordinate is minimized. In a bubble chart, the bubble size is used to weight each point’s contribution to the difference. Right-click a marker or a bubble of the desired group and select Add Trendline from the context menu. Select a partition line (see Partition). In the toolbar you can choose a group of values and the line is changed to a trendline for this group. You can change the background color on one side of the line and move the line in the same way as for a partition line (see Partition). However, once you have moved the line, it will no longer be calculated from the values in the datasheet. You can add a partition line to scatter or bubble charts to point up a partition of a set. To add a partition line, select Add Trendline/Partition from the chart’s context menu. You can move the line by clicking on it and dragging it to the desired position. It is also possible to select the partition line and then drag the handles at the beginning or end of the partition line. While dragging, the end points will snap to nice values. The spacing of the snap points depends on your current zoom level. If you hold down the Shift key while dragging, the angle of the partition line is constrained to the current angle or to that of a vertical, horizontal or diagonal line. To make a copy of a partition line, hold down the Ctrl key while dragging. This is an easy way to create parallel lines, e.g. to mark a range of values. You can change the background color of a set by clicking on the partition line and selecting a background color from the toolbar. To set the background color of the area on the other side of the line, right-click the partition line and select Flip Filled Side. You can also simply double-click the partition line. If you want to calculate the position and angle of the line based on the values in the chart, see Trendline.